The fonts are mediocre, the browsing is awkward. I'm a very visual person, I miss this view more than anything. If there are any developers out there with some spare time on their hands, I would be willing to (within reason) fund development to get this happening. I would love a port of apples unicode font (same size) but hey I'll take what I can get. PM me if you're interested! The fonts and WPS are themeable, so you can change that. If you want to change how the screens transition and fit together (as oppose to how they look), you'll probably have to commit a lot of time/work into making that happen though. I am not trying to theme the WPS, nor the screen transitions. I am trying to change the Library browse view for albums, so they include the album name (in a big ish font), the album artist below in a smaller font, and the artwork on the left. Pretty much exactly what the image to the left shows. As far as the font goes, if you could point me in the right direction.. I love the default font that comes with the ipod, the fact that it is both antialiased and supports CJK fonts with a consistent and easy to read style is key. Probably this could be done via a plug-in, no? The Cover Flow plug-in is part-way there already (have you used that? Apart from the length of time it takes to build the art database I think it works impressively well - adding the artist name to the bottom of the display would get it a bit closer to what you want). Trouble is - who is going to write such a plug-in? 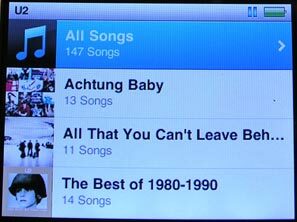 There's a lot of things I'd like to see added to Rockbox, if only I could magically acquire the programming skills to do it (its as much about being able to understand the existing code as it is writing something new). Maybe if I got bitten by a radioactive code-monkey I could gain the necessary powers.